For any band with what might be described as a “generous” recording budget, the temptation to experiment and push musical boundaries must be tantalizing. Especially back in 1967, at the dawn of the psychedelic era. For The Seeds, resisting this temptation was impossible. The Seeds can’t be criticized for this. After all, during the last two years, The Seeds had worked tirelessly to build a reputation as of the most innovative and eclectic bands of the era. They’d released two albums, A Web Of Sound and The Seeds, which featured Pushin’ Too Hard, the biggest single of their career. After this success, The Seeds decided to push musical boundaries to their limits for their third album Future. Future didn’t see The Seeds push musical boundaries to their limits. Instead they blew these limits away. The result was a mind-blowing fusion of psychedelia, garage, rock and pop. Veering towards jazz and soul, eclectic doesn’t even come close to describing Future. This was a long way from The Seeds roots as a garage band. This was very different. Maybe too different. Since 1967, when Future was released, it’s perceived as a minor classic. Despite that, it wasn’t a huge commercial success. Now nearly four decades later, Future has been rereleased by Ace Records’ Big Beat Records’ imprint. This is no ordinary reissue. Big Beat Records’ rerelease of Future is best described as a luxurious double album. Disc One features the original stereo version of Future, plus twelve bonus tracks, entitled the: “mono mixes.” Then on Disc Two, we find the Contact High: The “Future” Sessions. This includes fifteen tracks, which include alternate mixes and takes. It’s a fascinating insight into the direction The Seeds’ music was heading. It’s an eye-opening, insightful document into the experimental nature of the music. Then there’s the sleeve-notes. As someone whose been lucky enough to write sleeve-notes, Alec Palao’s sleeve-notes are a labor of love. In-depth, articulate and insightful, there’s everything you want to know about The Seeds, but were afraid to ask. Quite simply, if you’re a fan of The Seeds, sixties psychedelia or even are just curious about this minor classic, then Future, which I’ll tell you about, is well worth investigating. By 1967, the four members of The Seeds, Sly Saxon, Daryl Hooper, Jon Savage and Rick Andridge were enjoying the fruits of their musical labors. They’d enjoyed two hit singles, Pushin’ Too Hard and Can’t Seem To Make You Mine. This brought commercial, critical acclaim and a much higher profile. It also afforded The Seeds the opportunity to push musical boundaries further. No longer were The Seeds a garage band. That was in the past. Music was changing and so were The Seeds. The Beatles’ psychedelic masterpiece Sgt. Pepper’s Lonely Heart’s Club Band was the way music was heading. It was unique, a musical one-off. No other band could replicate Sgt. Pepper’s Lonely Heart’s Club Band. They could be inspired directly or indirectly. After all, it had worked its way into music fan’s subconscious. That would be the case with Future. Just like the two previous Seeds albums, the eleven tracks were written by the band. The Seeds leader, Sly Saxon, was at the heart of Future, playing his part in each track. He wrote four tracks, Painted Doll, Flower Lady and Her Assistant, Two Fingers Pointing At You and Six Dreams and penned Out Of The Question with Russ Serpent collaborating. Sly and Daryl Hooper proved a potent songwriting partnership. They penned Intro/March Of The Flower Children and Fallin,’ They pair also cowrote Travel With Your Mind, Now A Man and A Thousand Shadows with Jon Savage. With more than enough material, and a more generous budget than previous albums, The Seeds headed into the Future. Work on what became Future first started on 3rd November 1966. The first track recorded was Travel With Your Mind. Guitarist Sky Saxon was absent for laying down the rhythm tracks. Only three Seeds were present. They were drummer Rick Andridge, guitarist Jon Savage and keyboardist Daryl Hooper. Playing bass Harvey Sharpe. Later, Hammond organ, tremolo guitar and cymbals were overdubbed. Then a reverberating bass, Sky’s vocal and tambourine were overdubbed. At last Travel With Your Mind was recorded. Now The Seeds headed out on tour. 16th January 1967. The first track they recorded was March Of The Flower Children. On what was day one of recording, The Seeds were experimenting. They were joined by trumpeters Ray Caton and Oliver Mitchell. Thinking on their feet, The Seeds experimented. Sixteen takes later, and having incorporated a myriad of studio trickery, on what was essentially basic studio equipment, The Seeds had a take. Now they went on tour. After nearly two weeks on tour around Northern California, The Seeds returned to Gold Star Studios. Again, recording was an involved process. Numerous takes and an eclectic selection of instruments were used to record what became The Flower Lady and Her Assistant and Rides Too Long. Two more songs in the bag, that was the only recording session until 3rd February. Slow progress describes the recording of Future. That proved to be the case. The recording sessions on 3rd February proved to be fruitful. They worked on Rides Too Long, Sad and Alone and Flower Lady. Even better, a new song, Two Fingers Pointing At You was recorded. Demonstrating the experimental and eclectic nature of what became Future, a harpsichord and maracas were brought in. This was the start of a pattern that would emerge. Recording stretched into March, April and May. Numerous session musicians were brought in to play on Future. This included Beach Boys’ drummer Hal Blaine, a string section, tuba player George Callendar, harpist Gayle Levant and multi-instrumentalist Tjay Cantrelli, who played flute, vibes, clarinet, woodwind and harmonica. Even an unknown tabla player came and went like a ghost. For anyone who happened to be around the studio, watching Future unfold must have been tantalizing. Eventually, recording was over. The Seeds had more music than enough music for Future. Having whittled Future down to eleven tracks, Future was released during the second half of 1967. Before the release of Future, A Thousand Shadows was released as a single. It stalled at just number seventy-two in the US Billboard 100. Future didn’t do any better. It stalled at just eighty-seven in the US Billboard 200. While Future hadn’t been a huge commercial success, it proved to be a minor classic. It’s best described as a mind-blowing, genre-sprawling, slice of sunshine-psychedelia. Quite simply, what I’m about to tell you about is a musical tour de force of trippiness. 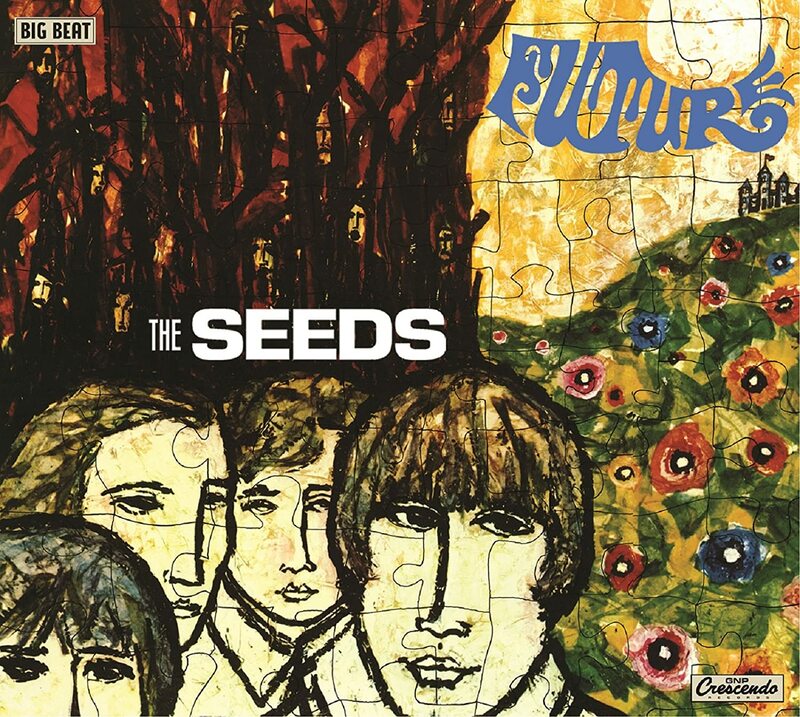 Opening The Seeds third album Future is Intro / March Of The Flower Children. Flourishes of harp accompany drawling half-spoken vocal. This understated backdrop gradually fills out. Organ, guitar and a tuba panned hard left are joined by growling horns and piano panned hard right. Whips crack, while the almost surreal, whimsical lyrics aren’t so much sung, but half-spoken. Psychedelia, folk, jazz and pop are rolled into one. Think of excerpts of J.R.R. Tolkien’s Hobbit put to song, and you’re getting close. Searing guitars open Travel With Your Mind which The Seeds dedicated to everyone who was incarcerated in institutions. Quickly, the track combines rock and Eastern music. As two continents music meet head on, Sly’s earnest vocal is enveloped by layers of eclectic, enthralling sounds. Giving the track a particularly trippy sound is the way very different instruments are panned left and right. Mind you, that’s no bad thing. The guitars which are panned right dominate the right half of the mix while tablas, percussion and bongos adds an exotic Eastern influence. Along with what are easily the best lyrics on Future, this is an early contender for the highlight of Future. Out Of The Question sees is very different from previous track. Here, The Seeds become a hard rocking garage band, while Sly’s vocal is best described as proto-punk. The Seeds haven’t forgotten the psychedelia. There’s still a lysergic influence as towards the end of the track, The Seeds remind me of The Doors. I keep expecting them to launch into: ”break on through to the other side” from L.A. Woman. Chameleon-like, The Seeds veer almost seamlessly between garage, proto-punk, and rock. Straight away, you realize Painted Doll is played at the tempo of a waltz. Adding to what’s a compelling nature of the track are sweeping doo-wop harmonies. Meanwhile Sly becomes a fifties crooner. With weeping strings, harpsichord and piano for company, it’s a heartbreaking, melancholy combination. Especially, when Sly delivers a soul-baring vocal. By the end of the track you’re confused and excited at the sheer eclectic nature of the track. I’d describe it as what you’d get if Bing Crosby jumped onboard the Magic Roundabout with Frankie Lymon’s Teenagers. Sounding like the soundtrack for a sixties horror film, Flower Lady And Her Assistant unfolds. Soon, it’s all change. It’s psychedelia time. Keyboards, driving rhythm section and tambourine accompany Sly’s strutting, Jagger-esque vocal. As the tempo increases, harmonies sweep in, as the track fuses rock, psychedelia, garage rock and even a twist of folk. Again, there’s more than a hint of The Doors buried in the mix. Having said that, that’s just one of a myriad of influence you encounter. The lyrics? They’re surreal and lysergic and have a trademark sixties sound. Best described as an eclectic fusion, its charms are hard to resist. Dramatic. That describes the introduction to Now A Man. Sounding like The Who, a driving rhythm section power The Seeds along. Chiming guitars and chugging bass accompany a preening, boastful, strutting vocal. It comes across as ironic. Whether that was the idea, who knows? If it was, then the lyrics could be seen as a scathing comment on what it takes to become a man. Pop your cherry and suddenly, you become invincible. Even though many critics have criticized the lyrics on Future, this is proof that The Seeds could write a great three-minute pop song. Haunting, moody and dramatic. That’s what A Thousand Shadows sounds like before it explodes into life. It’s another fusion of musical genres and influences. Everything from folk, psychedelia, rock and jazz are rolled into one. As the rhythm section drive the galloping arrangement along, a chiming guitar replies to Sly’s gnarled, dramatic vocal. Two minutes later, A Thozacateusand Shadow have set. One of Future’s most dramatic and evocative tracks is over all too quickly. Searing Hendrix guitars, shakers and harpsichord join a broody bass as Two Fingers Pointing On You unfolds. Like so many tracks, it’s a melting pot of influences, instruments and surprises. By now, you’ve realized don’t second guess The Seeds. It’s like climbing onboard a psychedelic roundabout. Tubas, organ, thunderous drums and jangly pianos assault your senses. They’re all in the mix. Sly struts and snarls, while cascading harmonies add to this mind-altering, gene-sprawling opus. It’s all change again on Where is the Entrance Way to Play. Sly scats as harmonies accompany him. Soon stabs of keyboards, harpsichord and woodwind join The Seeds rhythm section. Sly’s vocal is languid drawl, while the arrangement is bristling with energy and electricity. Proof of this is the piano, which is pounded. The keys are punished. It’s worth it though, as this fusion of folk, psychedelia and rock reaches a dramatic crescendo. When rolls of thunder give way to floods and thunderstorms at the start of Six Dreams, I’m fully expecting the Four Horsemen of The Apocalypse to arrive at my door. Dramatic, broody and moody describes the arrangement, while Sly dawns a disguise. It fits the bleak backdrop. His vocal is reminiscent of Jethro Tull and a whole host of prog rock bands. Veering between broody, moody, haunting and disturbing, by the end of the track I’m hiding behind the sofa, fearing the arrival of either the Four Horsemen of The Apocalypse or the rapture. That’s how evocative a track this is. Indeed, it’s a demonstration of The Seeds versatility and creativity. Closing Future, is Fallin,’ a near eight-minute epic. It picks up on the drama of Six Dreams. Flourishes of harpsichord, pizacato strings and the rhythm section join forces. Sly’s vocal is a dramatic, snarl as the frenzied track unfolds at breakneck speed. Again the piano is punished, before theatrical sound-effects sweep in. Later, fuzzy guitars, washes of Hammond organ, rolls and fills of drums join feedback. Briefly, Sly’s vocal is akin to primal scream therapy. Fast and furiously, the track unravels. Curveballs and surprises flit in and out. Brief bursts of harmonica, further flourishes of harpsichord and a cacophony of spirited harmonies and shrieks combine. By now, it’s like a freeform jam session. Everyone does their own thing. Remarkably, it all makes sense. As the track ends, The Seeds are nearly spent, exhausted at the effort expended in this grande finale. As an added bonus, Disc One includes the mono mixes. These twelve tracks include most of the tracks on Future. For purists, the mono mixes are a welcome addition. Even better are the contents of Disc Two. Entitled Contact High: The”Future” Sessions, this includes fifteen bonus tracks. Among them, are alternate takes and alternate mixes. There’s even Take 7 of A Thousand Shadows. These tracks are an intriguing insight into The Seeds modus operandi. They were perfectionists it seems. That may not be obvious listening to Future, but they were. Future it seems, were a prolific band. In total, there are ten tracks that were recorded for Future, but weren’t included on the album. That’s nearly enough for an album. Many a band would’ve sneaked these tracks out as an album. That they didn’t, again demonstrates the Seeds were perfectionists. Quality control was important to them. There are some hidden gems on Disc Two. This includes Rides Too Long, Chocolate River, Sad and Alone and Contact High. They’re the best of the tracks that didn’t make the cut on Future. These tracks are to go to lay unheard. Indeed, there’s merit in every track’s inclusion. Not only are they a snapshot of The Seeds as a band, and how they were evolving, but how music was in a transitional phase. That makes Disc Two an important and insightful musical document, that’s enlightening musically. Describing The Seeds’ third album Future as eclectic is an understatement. It draws inspiration from disparate musical genres and influences. Everything from rock, garage rock, psychedelia, folk, jazz, doo-wop, free jazz, proto-punk and even prog rock, before the genre was invented. With every listen, further surprises and subtleties reveal their hidden secrets. Rather than seamlessly flowing from one genre-specific track to another, Future is like a musical chameleon. Every track is like a surprise, with hidden depths. Bravely, The Seeds even change tempo. 4/4 isn’t enough, a 3/4 waltz beat is introduced. Similarly, a diverse selection of instruments are deployed. Joining The Seeds rhythm section and keyboards, are a string section, woodwind, tuba, harp, harmonica, clarinet, percussion, piano and Hammond organ. Then there’s tablas. Indian instruments are used extensively on Future. Indian music and instruments are used throughout Future. That’s not unusual. What The Beatles did, everyone copied. That’s including their psychedelic masterpiece Sgt. Pepper’s Lonely Heart’s Club Band. Future is no Sgt. Pepper’s Lonely Heart’s Club Band. Granted Future is a fusion of influences, including psychedelia, but it lacks the polish of Sgt. Pepper’s Lonely Heart’s Club Band. Considering The Seeds started life as a garage band, that’s no surprise. It would be easier to say that The Seeds were influenced by Frank Zappa, Thirteenth Floor Elevators, even the nascent Doors, The Who and the British invasion bands. After all, there’s more than a healthy twist of flower power combined with The Seeds psychedelia. Listen again, and other influences reveal themselves. There’s jazz and doo-wop which less than a decade earlier, was popular musical genre. As I said earlier, Future which was recently rereleased by Ace Records’ Big Beat Records’ imprint, is a genre-sprawling album. It’s also a genre-defying album. Future which is a genre classic, defies definition. Magpie-like, The Seeds seem to collect musical genres and influences, put them into their lysergic melting pot and sprinkle some secret ingredients. What comes out of The Seeds melting pot was Future, the aural equivalent of lysergic acid. Under appreciated upon its release, that’s no longer the case. Now we realize that Future is a mind-blowing, boundary breaking and genre-defying album, which saw The Seeds tear up the rule book and rewrite it. Standout Tracks: Travel With Your Mind, Out Of The Question, Painted Doll and Six Dreams.